"Road to Remembrance Trail" Will Honor All 30 Service Members from Suffolk County. County Executive Bellone & Legislator Spencer posing with Gold Star Families to unveil the ceremonial “Road to Remembrance Trail." Bay Shore, NY - September 29, 2017 - Suffolk County Executive Steve Bellone recently joined Suffolk County Legislator William “Doc” Spencer to unveil a ceremonial “Road to Remembrance Trail" at the Third Annual CHS Suffolk County Marathon. The third-of-a-mile trail, which is a portion of the actual Marathon and Half-Marathon route, will be dedicated to the memory of 30 Suffolk County fallen military service members killed in the line of duty since September 11, 2001. The Trail crosses over the Amity University campus located in Oakdale. County Executive Bellone and Legislator Doc Spencer were joined by Gold Star parents family members who lost loved ones that paid the ultimate sacrifice. The CHS Suffolk County Marathon was created to help raise critical funds needed to support organizations that cater to the needs of veterans in the County. To date, more than $300,000 have been raised and all proceeds distributed to a wide range of veteran service organizations who are committed to improving the quality of life for veterans. Suffolk County has the largest veteran population in New York State. The Third Annual CHS Suffolk County Marathon will be held on Sunday, October 29, 2017. 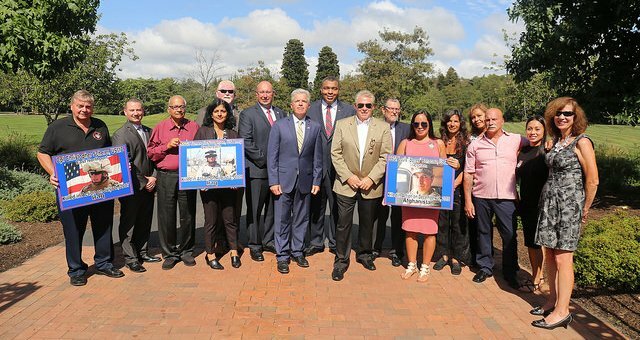 Subject: LongIsland.com - Your Name sent you Article details of "County Executive Bellone Joins Gold Star Families To Unveil Trail Dedication In Honor Of Military Members Killed In Action Since 9/11"